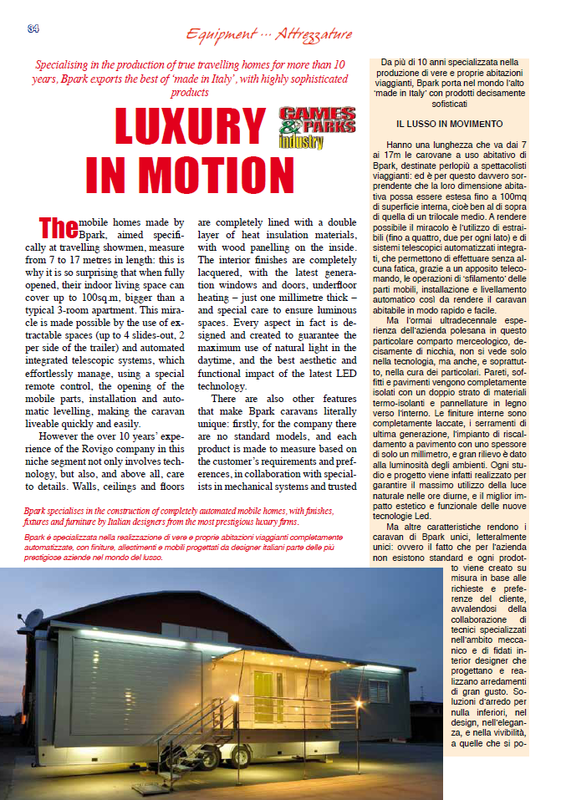 Specialising in the production of true travelling homes for more than 10 years, Bpark exports the best of ‘made in Italy’, with highly sophisticated products. 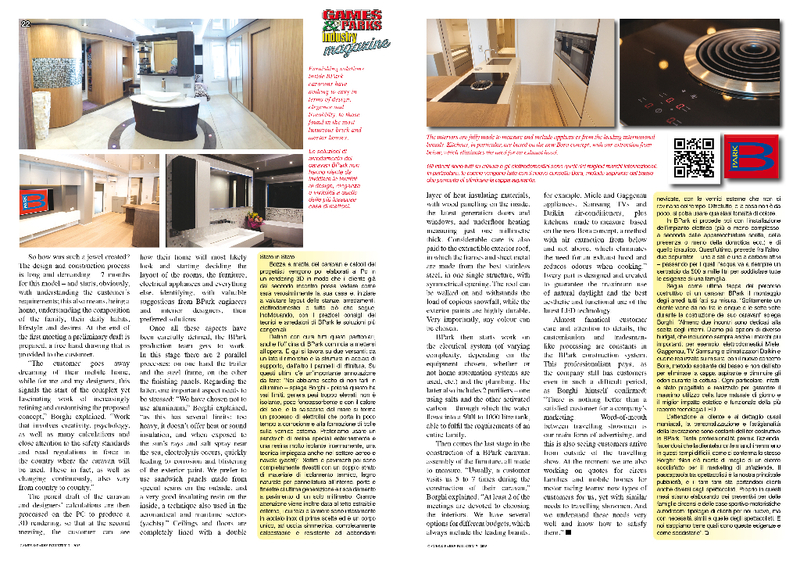 The mobile homes made by Bpark, aimed specifically at travelling showmen, measure from 7 to 17 metres in length: this is why it is so surprising that when fully opened, their indoor living space can cover up to 100sq.m, bigger than a typical 3-room apartment. 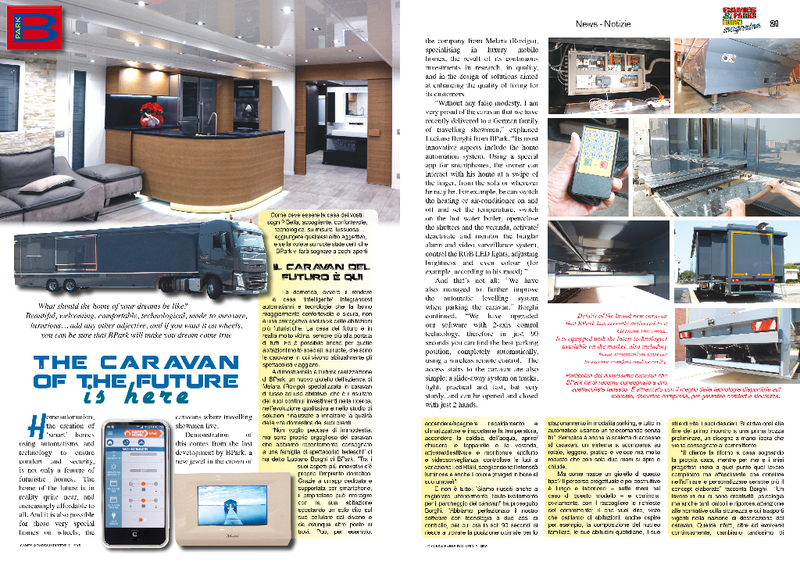 This miracle is made possible by the use of extractable spaces (up to 4 slides-out, 2 per side of the trailer) and automated integrated telescopic systems, which effortlessly manage, using a special remote control, the opening of the mobile parts, installation and automatic levelling, making the caravan liveable quickly and easily. However the over 10 years’ experience of the Rovigo company in this niche segment not only involves technology, but also, and above all, care to details. Walls, ceilings and floors layer of heat insulation materials, with wood panelling on the inside. The interior finishes are completely lacquered, with the latest generation windows and doors, underfloor heating – just one millimetre thick – and special care to ensure luminous spaces. Every aspect in fact is designed and created to guarantee the maximum use of natural light in the daytime, and the best aesthetic and functional impact of the latest LED technology. 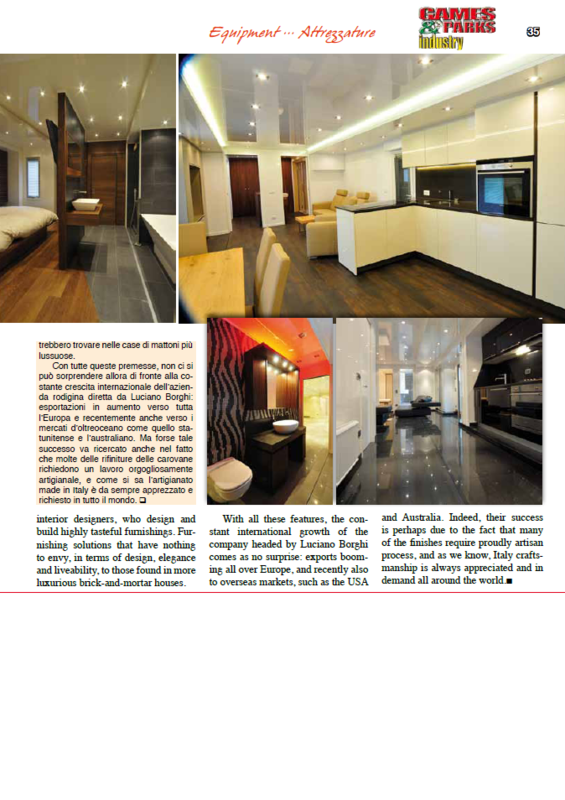 There are also other features that make Bpark caravans literally unique: firstly, for the company there are no standard models, and each product is made to measure based on the customer’s requirements and preferences, in collaboration with specialists in mechanical systems and trusted interior designers, who design and build highly tasteful furnishings. Furnishing solutions that have nothing to envy, in terms of design, elegance and liveability, to those found in more luxurious brick-and-mortar houses. With all these features, the constant international growth of the company headed by Luciano Borghi comes as no surprise: exports booming all over Europe, and recently also to overseas markets, such as the USA and Australia. Indeed, their success is perhaps due to the fact that many of the finishes require proudly artisan process, and as we know, Italy craftsmanship is always appreciated and in demand all around the world.